A long time ago in a galaxy far, far away, warring tribes battled for land, riches, and women and knew nothing of the world outside of the their territories, save for mystical tales and rumours of distant lands. 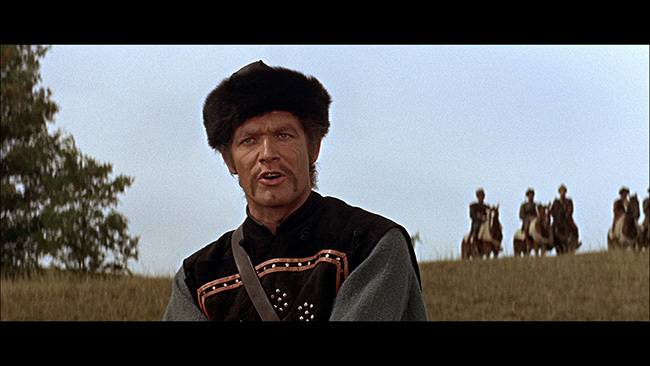 The Yesugei tribe is one of these groups, finding themselves surrounded by a bloodthirsty bunch led by the vicious Jamuga (Stephen Boyd), who has the leader of the Yesugeis dismembered through dragging by horse. 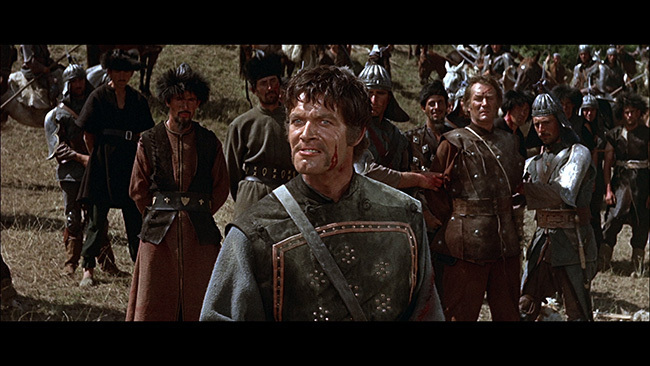 Jamuga's next step is to kill the son of the leader, but the young Temujin (Omar Sharif) bears the mark of blood on his palm; a sure sign that the one to take his life will die next. Jamuga instead opts to place a chang, a heavy wood and steel collar, around young Temujin's neck, rendering him the laughing stock of others and guaranteeing a childhood of suffering, toil, and merciless beatings, and it's pretty obvious early on that the youngster's gathering head of steam will result in trouble for Jamuga. Sure enough, after a humiliation from which Temujin is saved by the Princess Bortei (Francoise Dorleac), Temujin's rage boils to the surface and he challenges Jamuga to remove the chang to see who the better man is. Jamuga complies and Temujin escapes to the woods with two faithful followers. It is here that Temujin realizes his destiny; to unite the warring Mongol tribes and gather territory, eventually expanding into other lands, such as the one to the East that is rumoured to have a "Great Wall". Realizing he'll need more than his two friends to help him, he sets out to free some captive Salkits tribe members, led by Shan (Telly Savalas), and follows that up by rescuing a number of women slaves from a caravan owned by the Shah of Khwarezm (Eli Wallach) so that his men will be happy and relaxed. The cherry on the sundae comes with the kidnapping of Princess Bortei to make as his own wife doesn't start off well, as Bortei apparently doesn't like being kidnapped; but she comes around after about 2 minutes of defiance to give up her womanly goods for Temujin. A furious Jamuga kidnaps her back in an attempt to plant his seed in her, spoiling her for his nemesis, but Temujin is content to ignore this and instead welcome the birth of his son. 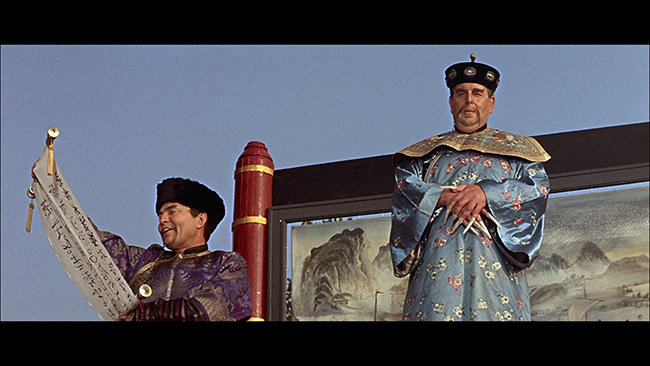 With all of this warring, though, comes the need to expand his army, and Temujin is granted the opportunity when he assists another caravan, this one occupied by the very Chinese ambassador, Kam Ling (James Mason...no, really), and owned by the Emperor of China (Robert Morley...no, really). 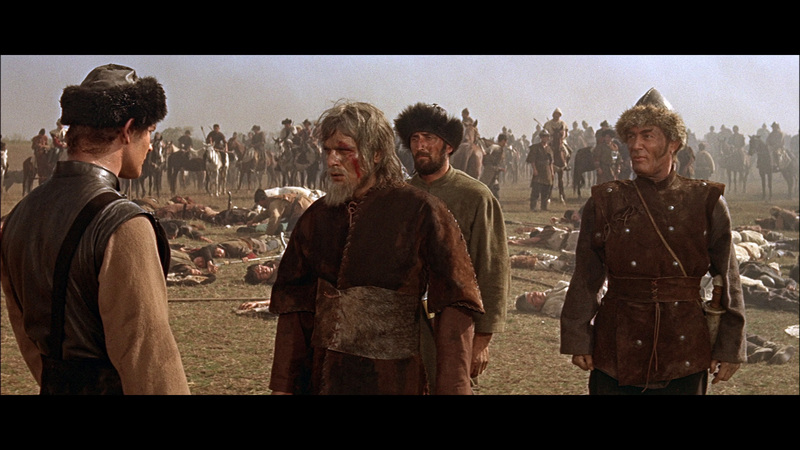 In turn for not murdering the ambassador, the Emperor takes Temujin under his wing and names him, "Genghis Khan", giving him the opportunity and the manpower to defeat the Manchurian armies led by Jamuga. 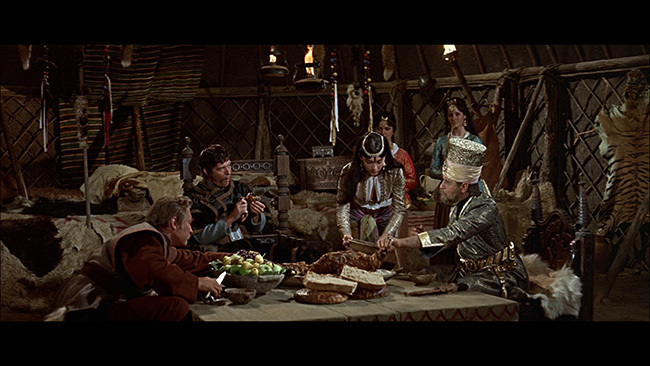 But the new Khan's destiny lies in contradiction to the Emperor's plans for him, and Temujin must break free of the Emperor's leadership to settle his quarrel with Jamuga, who has found a new ally in The Shah Of Khwarezm. 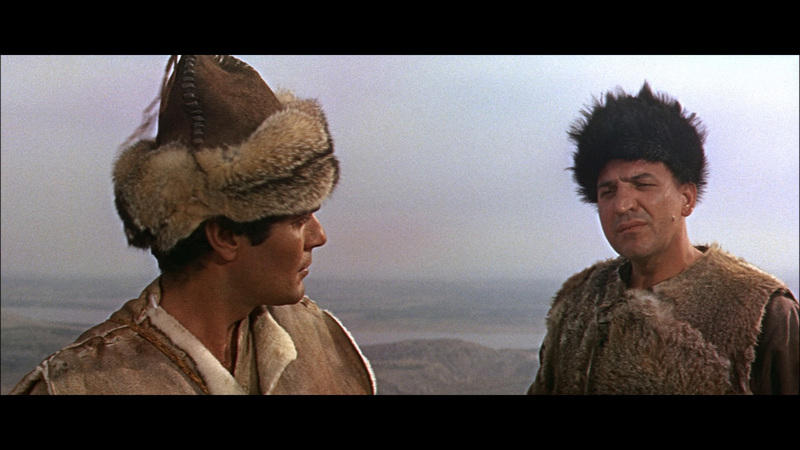 Henry Levin's film version of the story of Genghis Khan takes a whole lot of liberties with history for the sake of telling an entertaining story, but still manages to not be that entertaining. At just over two hours running time, Genghis Khan is a rather silly film in which a whole lot of nothing seems to happen in a whole lot of time. Those craving the action and adventure found in pictures of the time will likely be put off by the extreme talkiness of the film, and those looking for a thought-provoking story will likely not find it here. 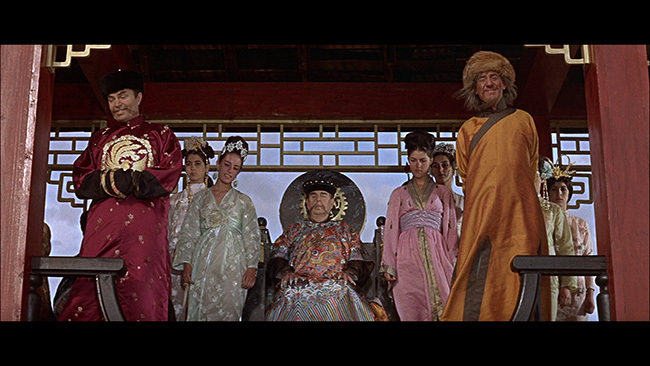 Instead, one can expect some traveling, some light-hearted banter, some mild humour, intentionally delivered by Telly Savalas' character; and some unintentional humour, delivered by James Mason's "Ah, soooo" grinning Chinaman caricature. 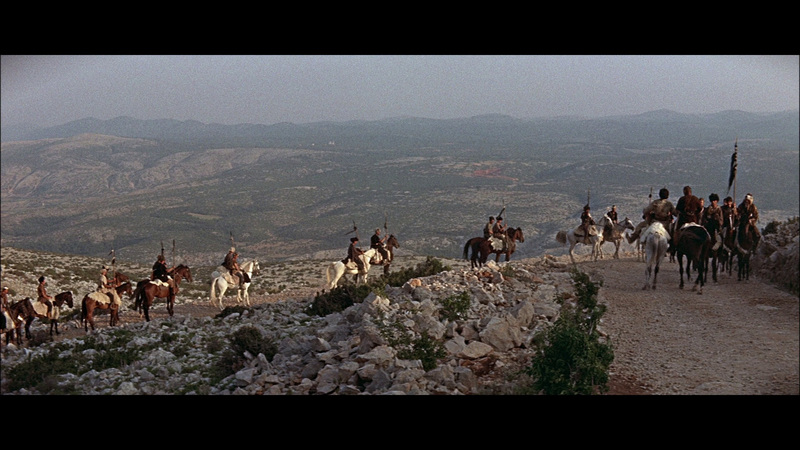 That being said, Genghis Khan is a pretty great-looking film, with it's colourful costumes and beautiful scenery shot in the former Yugoslavia, courtesy of director of photography Geoffrey Unsworth; D.O.P on the also boring but fantastic-looking 2001: A Space Odyssey. But with all flash, little substance, and even littler historical accuracy, this telling of the Prince of Conquerors proves uninspiring. 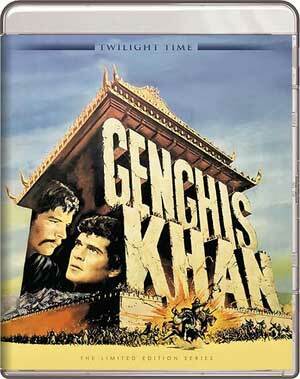 Twilight Time brings Genghis Khan to Blu-ray with a 2.35:1 AVC-encoded transfer that does well for film over 50 years in age. Though there are some minor flaws in the picture, most noticeably some judder and a bit of strobing, the image is mostly stable with good colours and solid black levels. The audio track represented is a DTS-HD Master Audio 1.0 track (I can't convince my player/receiver to get past DTS-HD MA 2.0) and it carries the dialogue and sounds of battle adequately, with the occasional onset of tinniness. English Subs are available for the feature, which also includes and Isolated Score and Effects track. A Theatrical Trailer, the usual Twilight Time Interactive Catalogue, and a liner note essay by Twilight Time's Julie Kirgo is also included. 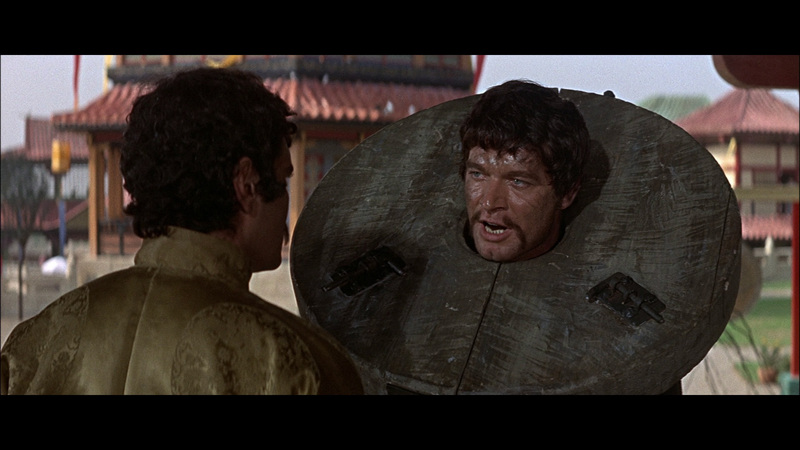 It's sometimes difficult to gauge the merits of a film that may have been far more meaningful 50 years ago, but in the present day, this version of Genghis Khan falls flat. For fans of the film, the Twilight Time disc provides a pleasant way to take in the cinematography, with minimal supplements. 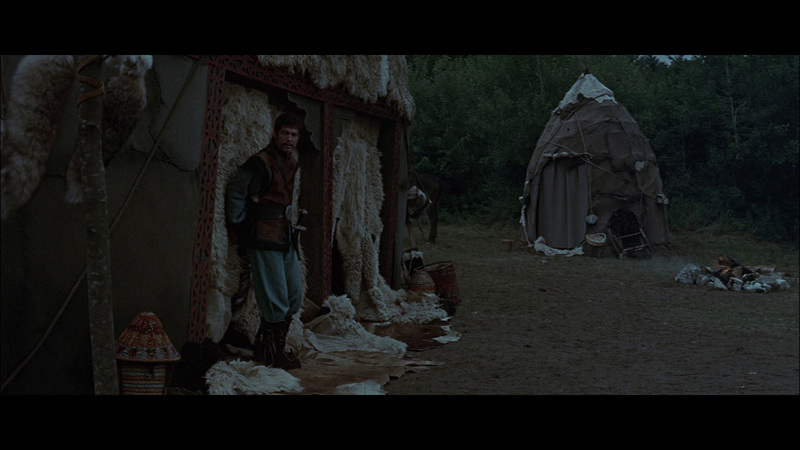 Click on the images below for full sized Genghis Khan Blu-ray screen caps!